All is quiet now. The phone is quieting down, and the pomp and circumstance of all the funeral arrangements are now complete. I’m left with a quiet house, sweet memories and a knot inside of me. The days leading up to the services and the planning that is involved was absolutely taxing. I’ve never been involved that much with the process of planning a funeral and a visitation before, but it felt as though we were planning for a wedding on five days notice. The funeral home that we went through was very good and helpful, and a family friend from church helped us to plan things out for the church service and luncheon. Trying to decide how many people were actually going to attend the luncheon was difficult. Its not like you send out invitations with an RSVP for a funeral… Other obligatory duties like picking out a casket, to the songs we wanted for not only the service but also the video, and finding all of the photos, oh and do you want to add this, or that, and don’t forget the $300 + it costs to place an obituary in the newspaper was enough to make your head swim. The visitation was so surreal, and unreal… Since last Tuesday (July 1st) i’ve had this nervous knot in my stomach. Mostly I don’t know what to do. Do I want to sit or stand, or be alone, or be surrounded by people? I don’t know. I can feel this knot called grief twisting inside of me. Part of this fear in anguish is the shocking reality of the brevity of life. I’m reminded of what David says in the Psalms, “Lord, remind me how brief my time on earth will be. Remind me that my days are numbered – how fleeting my life is. You have made my life no longer than the width of my hand. My entire lifetime is just a moment to you; at best, each of us is but a breath.” ~ Psalm 39:4-5. I’ve read that verse a hundred times, and thought previously, okay, live life to the fullest now, because life is short. Everyone says life is short, but the sobering reminder that tomorrow really is not promised to anyone takes my breath away. So many people came out to pay their respects to my father, or to my siblings, my mom, and myself. I was blown away when I saw my old co-worker, and some high school friends walk in, and know undoubtedly, even if we don’t talk every day I’m loved. Love was certainly the theme of the past few weeks be it love of friends, sharing memories about my dad on how much he loved, or the love that God has for all of us that he took our place on the cross so that we could spend all of eternity with him. There was a constant flow of people hugging me, and asking me how I’m doing. That had to be the most difficult question in the world, because I didn’t know, and I still don’t know. Depending on the moment, the mood, and my surroundings I can be in the acceptance stage, the denial stage or the anger stage, and sometimes all at the same time. I think there are more than five stages of grief, and so long as you’re not acting destructive to yourself or others, I think any feeling is game. I felt a perverse horror come over me when one friend was hugging me and crying and I just broke out in an uncontrollable laughter.I had to keep most of it in, and couldn’t believe that I was laughing, because the situation was certainly not funny, and we weren’t sharing a funny memory either. Freud may argue that it was a coping mechanism but I think at that moment the fact that my dad was in the front of the church in a casket was so absurd and unreal that I couldn’t believe the situation I was in. Perhaps if I laugh this will not be my reality and I will finally wake up from this terrible nightmare. The morning visitation was a different feeling all together. The visitation was in the side chapel, and instead of stationing myself out with the masses I sat in the chapel and stared at my dad the entire time he was in there. I was inconsolable, because I didn’t want to be. Tears poured out of my eyes like Niagara Falls, and I just wanted to stare at my dad and will him to get up and walk and live. Knowing that this was my last time seeing his face was just unbearable. I couldn’t talk and when people asked how I was doing I just shook my head giving them a silent, “Not good at all”. This was time for me… where I didn’t have to talk to anyone, or be that, “Strong Christian Woman”. I couldn’t do it any longer. Not that I am or was being a pretender, but this was a moment for me, to feel exactly however I wanted to feel. When it was time to say our final goodbye, and close the casket I covered my mouth with my hands. I think I let out a gasp because reality had stung like a bee. My siblings, and mom and husband and all clung to each other so tightly. We placed the paul out over the casket, and walked with tears in our eyes to the front of a packed church. The songs and readings we had picked out were such a blessing to us. We chose Psalm 23, Isaiah 40:28-31, Romans 8:31-35, 37-39, and John 11:17-27, and Gods truth that heaven is a real place, and that through the love of Christ my dad gets to spend forever there. I have to trust that God is sovereign and has a plan in why the medics and nurses and doctors could not save him. In America we are offered the best medical care in the world, but when its our time, it is our time. After a luncheon which offered us a brief moment to thank everyone for coming out we headed out to Fort Snelling for military honors service. 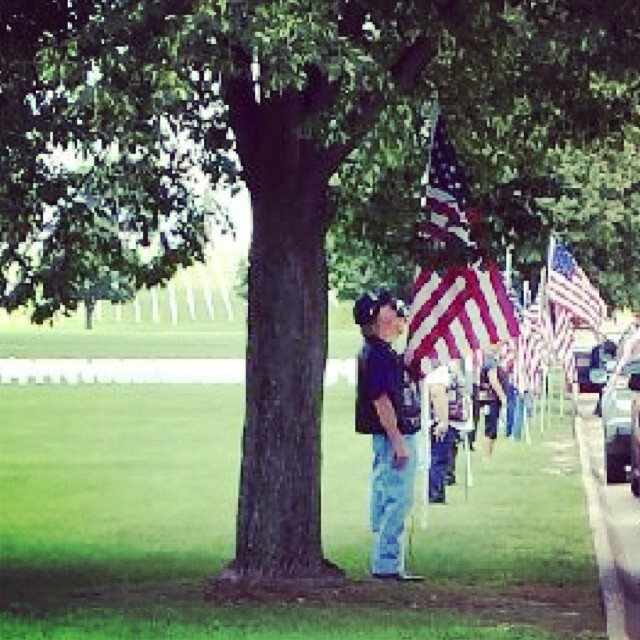 We invited the Patriot Guard to come out and stand in a flag line as well. Most of whom were veterans themselves it was an amazing sight to see. Both the beautiful promises from God during the mass, and the honors my dad received from the honor guard and patriot guard helped to cast the first stitch in mending my broken heart. 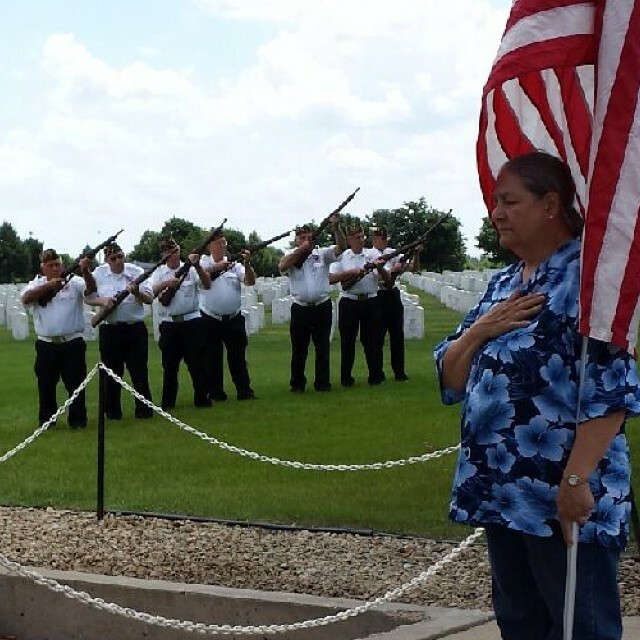 LA • This entry was posted in Faith, Family and tagged bereavement, Burial, dad, death, father, flag, Fort Snelling, grief, gun salute, loss, military honors, parent loss, patriot guard. Bookmark the permalink. Beautiful Linds! It is a long journey. God Bless you! You are a beautiful writer, Dear. Thank you for sharing yourself in words that amplify the true spirit of your loving, faithful heart. Keep writing! We (readers) are lifted and gifted through your experience of grace in this difficult time of loss. I appreciate your honesty and I am so glad you took a moment to grieve how you needed. Oh Lindsay, your words are so raw and so beautiful. My heart breaks for you all. Loosing a parent with so much zest for life at such a young age is so hard for me to deal with because I work with individuals who question their existence on a daily basis. I think the hardest part is not being able to say good-bye properly. My dad passed suddenly as your dad did and even after almost 4 years its still hard to get passed that. Your knot will go away, help from a prescription my be in order (never hurts to ask)! Everything was just beautiful. 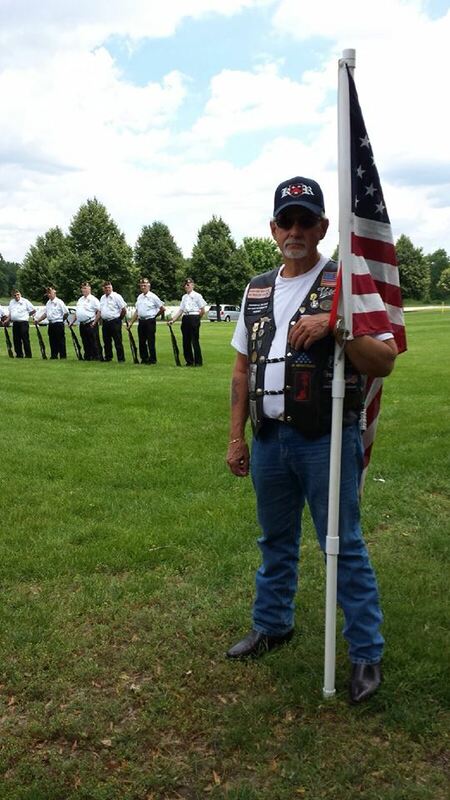 Loved the Patriot Guard, always wanted to join and maybe someday I will! The greatest memory for me will be watching and dancing with your dad! He would get those hands moving and his body shaking ……great fun! Lots of love and hugs from your cousin!